The Smok Infinix by Smoktech offers portability and hassle-free use of vape. Its great for on-the-go vapers or travelers who likes to bring their vape with them all the time. Its small, discreet and fits your pocket perfectly. The Infinix includes two refillable 2mL pods. It also features built-in 250mAh battery and LED indicator that illuminates both while charging (via micro USB port) and while in use. The modern angular body provides comfort and ease while remaining button-less as it uses breath activation. 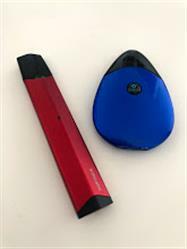 The way the Smok Infinix was designed makes it easier to insert the pod. Its just a quick pull out and pull in when you want to refill the pod with e-juice. It magnetically locks down the pod to the battery making it secure. No fire key, no up or down button, all you need to do is breathe in. It can not be easier to use vaporizer like this! I ordered the Smok Infinix few weeks ago and I was completely impressed. Its easy to carry around and charging only takes 20 minutes. Shipping was also quick! Price Match Guarantee*: Want to buy Smok Infinix Pod Kit for sale online at the cheapest price? Visit Slick Vapes to find the best discount and deals. We can match the sale price of any authorized dealer so you can purchase with confidence.